For a long time we have been trying to organise a holiday in Greenland and finally managed it this summer. The plan was to enjoy an outdoorsy holiday in a place which remains fairly wild and unspoiled. Also it is clear that Greenland will not stay this way forever. As the Arctic ice begins to visibly retreat, oil companies are moving in to try to exploit previously inaccessible northern reserves. President Obama recently approved Arctic drilling in Alaska by Shell, and Greenland has negotiated drilling rights with BP. The least densely populated country in the world, three quarters of the land mass of Greenland (or Kalaallit Nunaat to the locals) is permanently covered in the largest ice sheet outwith the Antarctic. What towns there are, lie on the coast, mostly on the southwestern part of the island. With no roads linking the towns, transport between them is by sea or by air. The population of this country, which has an area two thirds that of India where a billion people live, is 56,000, roughly the same as Inverness in Scotland. A Danish colony since 1814, Greenland is now semi-autonomous after 75% of the population voted for this in a referendum of 2008. Denmark still contributes approximately $600 million per year to the economy, about a third of the money for Greenland's public spending. Fishing is the main industry in Greenland, but with the receding glaciers and melting ice fields, people are now looking towards exploiting their largely untouched mineral and oil reserves to generate income and finance greater independence. Greenland has seen successive waves of settlement. The earliest were from peoples from Asia travelling across from the Bering Straits. In 2500BC the Saqqaq people settled in the west around Disko Bay, and they lived here until around 1300BC. Erik the Red and Norse settlers arrived from the east around 980AD and the medieval Icelandic sagas credit him with giving this land the name Greenland, to try and entice other settlers. The Norse settlers left about 500 years later. The Inuit "Thule culture" arrived from the north about 1300AD and are the ancestors of the current native Greenlandic people. Now about 88% of the people are Greenlandic Inuit, the rest largely of Danish descent. The world's most northerly capital city, Nuuk lies at the southern end of Greenland, a town of 16,000 people situated just south of the Arctic Circle. 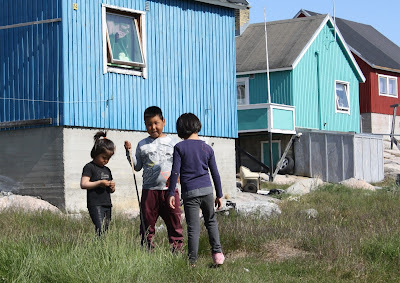 When we visited Greenland we came further north, to Ilulissat, their third largest town with a population of 4,500 and almost the same number of sled dogs. Formerly known as Jakobshavn, the town of Ilulissat lies 220 miles north of the Arctic Circle, on the west coast of Greenland, facing across Disko Bay to Disko Island. Previously in winter this area would be solid sea ice all the way across to Baffin Island and Canada. However every year the sea ice melts earlier and earlier in the year, retreating by about 13% per decade. In 1845 the attempt to traverse the Northwest passage, heading north from here to try to find a sea route above the north of Canada, defeated John Franklin and his men. Now cruise ships can easily make the journey for much of the year. The changes in sea ice also have major effects on the way of life of the northern Inuit peoples. The solid ice that was previously their highways for sled and snow-mobiles, connecting communities and taking them to winter hunting grounds, are no longer navigable for much of the year. When we flew from Iceland to Greenland in July 2015, looking out of the window the first thing that you see is the sea ice lying off the sparsely populated and mountainous eastern coast of Greenland. The ice here has an important role in the circulating sea currents of the northern Atlantic. Eastern Greenland is dominated by the ice cap and steep mountain ranges. 3500 people live on this coast in the isolated towns of Tasiilaq, Kulusuk and Ittoqqortoormiit. Flying over the coast the ice cap is soon seen covering the mountaintops. At its widest point Greenland is about 750 miles across and flying across this all that is visible from horizon to horizon is ice, looking like the surface of an alien planet. The ice cap is 3km thick but currently melting at a rate of 1 metre per year. The problem is that many people now feel that the melting is irreversible. The more that the white ice melts, the less solar radiation is reflected by it into the atmosphere, the warmer the atmosphere then becomes. Also the increased melt water affects the salinity of the northern Atlantic and disrupts the sea currents that control so much of our environment. All indications are that the melting of the ice sheet is accelerating. 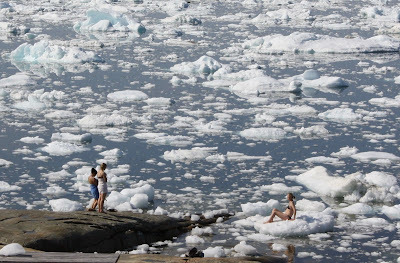 There is enough water held within the Greenland ice sheet to cause a 7 metre rise in sea levels around the world, so the speed at which it continues to melt will impact upon all of us. The town of Ilulissat on the west coast of Greenland is positioned close to the opening of the Ilulissat Icefjord. A Danish settlement, founded in 1742 as Jakobshavn, many of the 4500 inhabitants are employed in the local halibut fish processing plant, and now increasingly in tourism. Many also supplement their incomes by fishing themselves, and hunting throughout the year. I was surprised at the sight of many people casually walking about with rifles slung over their shoulder and the crack of distant gunfire was often heard. All through the summer huge icebergs float past the town into the northern Atlantic Ocean from here. The iceberg that is believed to have sunk the Titanic in April 1912 is believed to have been from the glacier here. The Ilulissat Icefjord is now protected as a UNESCO World Heritage Site, a site of international importance. Further up the Icefjord, several miles inland, one of the largest outflows of the Greenlandic Ice Sheet from Sermeq Kujalleq, or Jakobshavn Glacier, drains into the sea here, with icebergs "calving" frequently off of the edge of the glacier and into the sea. The icebergs then slowly move down the fjord, which is 1km deep, before becoming trapped at its opening into Disko Bay, where the water is more shallow at about 300m. Once the pressure from behind becomes too great a burst of icebergs floats out into the bay. We were there at the end of July 2015 and two weeks later BBC news carried the story that one of the largest ever sections of ice had calved from the glacier front. The glacier front here moves forwards at 20 metres per day, but the chunk which came away in early August 2015 is believed to be 12.9 sq km in size. 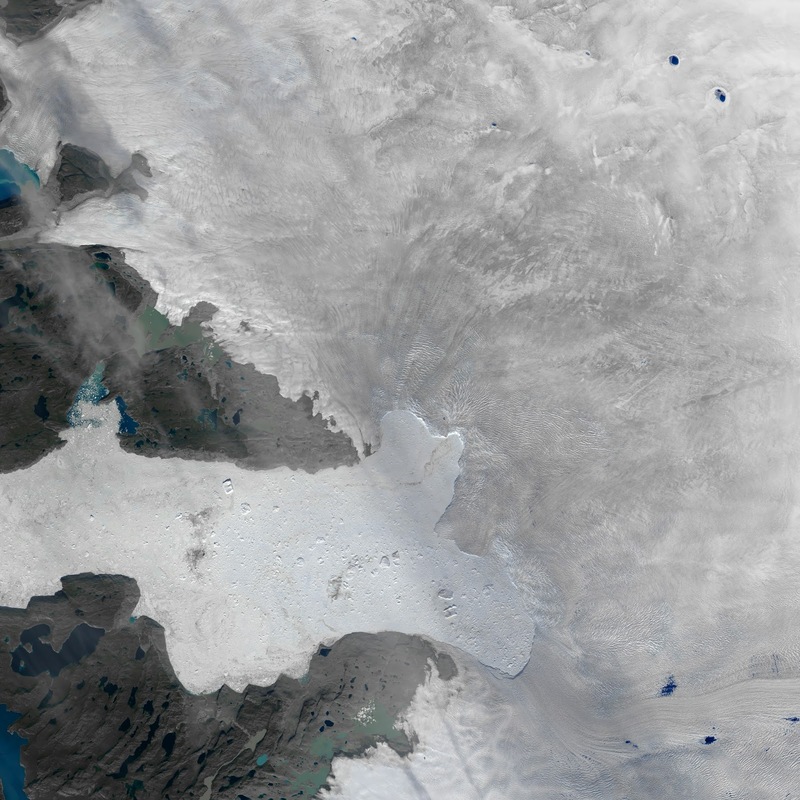 In the satellite image above from 2006, the retreating front of the glacier can be seen. The glacier lies to the right in the picture with the white tongue of ice heading to the bottom left hand corner being pack ice slowly moving down the icefjord to the sea. The town of Ilulissat lies just north of the opening of the icefjord into Disko Bay. You can see that the glacier front has retreated year on year from the earliest recorded position in 1851.
recent sudden advance in glacier "calving front". The recent image above is from the NASA Earth Observatory website. Satellite images two weeks apart can be compared on the website showing that a massive chunk of the glacier has now broken off into the icefjord. All over the world it is clear from recordings by scientists that the speed of glacier retreat is at "historically unprecedented" levels. What the images above unequivocally make clear is this happening in real time. Dictionaries may need to redefine what "glacial pace" now means. Local people told us that the day before we had arrived there was almost no ice in the bay off of Ilulissat, but that a huge iceberg which was blocking the outflow of the icefjord had moved in the night with a rush of icebergs behind it. 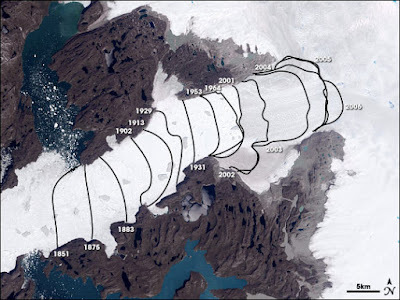 What is clear now is that two weeks later, with the cork from the champagne bottle removed, further back in the icefjord this allowed the huge chunk to fall from the glacier, witnessed in NASA's satellite images. We had come to Greenland from a cold wet summer in Scotland, prepared with waterproofs and warm fleeces for our Arctic trip. We unexpectedly spent the few days we had there wandering around in T-shirts and putting on suntan lotion. With 24 hour sunshine at that time of year, the midday temperature never fell below 15 degrees centigrade. In the warm sunshine we enjoyed some of the local football matches and went for long hikes out towards the icefjord, past the remains of the pre-historic settlements. The brown, wooden Zion's Church in Ilulissat dates originally from about 1781. It is a familiar site from many photographs of Greenland, with huge icebergs often passing behind it. A large anchor beside the door of the church is a memorial to those who have lost their lives at sea, a not unusual occurrence in these waters. Some of the icebergs can be several hundred feet high and only when close to them do you realise how much of their size lies beneath the water. The "white ice" is made from compacted snow, whereas the more dangerous "black ice" is made from re-frozen melt water. It is more dense and lies lower in the water and a local, upon whose boat we took a trip into the bay, told us that this is the ice which sinks the boats of the unwary in these waters. As the icebergs melt, and chunks fall off into the sea, they tilt and change shape as the weight shifts, sometimes flipping right over. This can cause sudden unexpected waves to crash onto the shore or boats which get too near. In the photo above you can see the algae which grows on the underside of the icebergs. This in turn feeds the krill, which is food for the many fish and whales that frequent these waters. So changes in the ice will impact on the local environment in many unpredictable ways. Whale watching trips can be booked in Ilulissat. As these take several hours to get far enough out towards the areas which whales commonly frequent we didn't bother booking one, but whilst just out in the bay on a short boat trip were lucky enough to see two humpbacked whales swimming about, near to the coast. Like seals, whales are hunted by the local people and seal meat and whale meat were available alongside many fish, at a stall in the town centre. Greenland has been granted an "Aboriginal Subsistence Whaling" quota by the International Whaling Commission. Greenlanders hunt mainly minke whales and fin whales, but in 2014 seven Humpback whales were also killed. In summertime in Greenland the sun never sets. At the latitude of Ilulissat the sun does not set below the horizon from mid-May until the end of July. By contrast in winter, after weeks without sunlight, the people of Ilulissat head to Sequinniarfik, a hill near the town, on January 13th each year to celebrate the return of the sunlight. The rest of the photographs below are some that we took on hikes towards the icefjord and on a flight over the calving front of the glacier. Known locally as Sermeq Kujalleq, this glacier is one of the few from which the ice of the Greenland ice cap reaches the sea. The only other place in the world where glaciers calve icebergs in this way is in the Antarctic. Many well maintained hiking routes allow you to walk out from Ilulissat town towards the icefjord. Only then does the true scale of the icebergs become apparent. From above the pack ice in the icefjord looks solid enough to walk upon, but it is constantly moving and unsteady. The moving glacier continues to cut the solid rock of the fjord, gouging it deeper. Looking down on the landscape here you can see in action the forces which sculpted the landscape of Scotland thousands of years ago, when our country was covered in glaciers. From these photographs below it is hard to picture the scale of the glacier. The ridges on the surface appear to be hundreds of metres high, like cliff faces, and vanish off towards the horizon. Although it is hundreds of metres high, the calving front of the glacier, which NASA witnessed retreating the week after our visit, can appear indistinct as the pack ice in the deep icefjord in front of it presents your eyes with a continuous white mass of snow and ice. When ice does break off it is accompanied by distinctive shotgun cracks and deep rumbles. After leaving Ilulissat our return flight to Iceland first flew down the west coast of Greenland. Although nowhere else we passed had the dramatic icebergs breaking off from the ice cap, the melting of the ice can be clearly seen, with melt-water channels forming new rivers carrying silt down to the sea. "We're very aware that we'll cause more climate change by drilling for oil. But what should we do? Should we not when it can buy us our independence?" The more that the world continues to rely upon fossil fuels the greater will be the rate of global warming. Nowhere is that more apparent than in Greenland and the Arctic where the environment has already changed within my lifetime. An exhibition in Ilulissat Art Museum included enlightening interviews with local people, giving their views on climate change. They could all see it happening and were aware of changes in the sea ice and hunting opportunities. Some commented sadly that last year hadn't felt like Christmas as by December it still hadn't snowed in the town. However many were happy to see their lives, which can be very tough in this environment, become easier. We cannot preach to countries or peoples who are in the frontline of these environmental changes. We cannot ask them to accept sacrifices for the benefit of us all, when we are carrying on as before. In the recent Scottish independence referendum of 2014 a weak point in the independence arguments was an over-reliance on the oil industry as a future source of income for our country. The same argument is obviously being made in Greenland, where their reserves are likely to be more vast and untapped than Scotland's now are. The questions of what would happen to the fishing industry of Greenland were an oil spill from drilling to occur, and the huge difficulties capping such a leak would create in this environment, here or in Alaska, have not yet been answered. The Arctic is being damaged by climate change and by the threat of oil drilling. In Glasgow we maybe feel that our winters are getting wetter and the summers maybe getting less sunny, but in Greenland you can see change happening in front of your eyes. As a tourist travelling to the area in an airplane powered by fossil fuels I know that my curiosity is contributing to the global problem, whilst the local people are striving to draw in more tourists to help their economy. This shows the problem that the world faces. Increasing demand for rare minerals and fossil fuels is leading to financial incentives in those nations that can access these resources, and further hastening environmental damage. I knew that I was heading to Greenland to find out what was happening to the environment there, I just didn't expect to come home and find it making the news a week later. Yet despite that important story that I mentioned above, this in fact got very little news coverage anywhere else. We all know things have got to change, but all vaguely hope that something will turn up. Capitalism doesn't work that way. Whilst profit remains the only incentive, we may as well start building higher sea defences now, and yet again the poorest countries are going to come off worst in that situation.